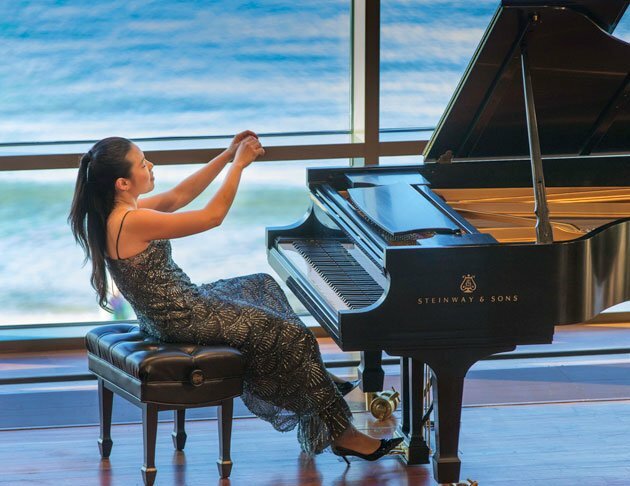 When Dubrovka Tomšič announced to David Deveau that she would be cancelling her Shalin Liu recital due to an inflamed finger, the Rockport Chamber Music Festival artistic director wasted no time in engaging 2005 Van Cliburn silver medalist Joyce Yang, who had appeared a couple of weeks earlier. If Yang had any trepidation about filling in for an august personage, she betrayed no hint thereof. On Sunday afternoon we heard a very confidently executed and interesting program of works based on “bipolar disorder” in Yang’s description. Surely Schumann’s alternations between pieces characteristic of the wild Florestan and those evocative of the dreamy Eusebius constitute a kind of madness, as do Rachmaninoff’s queasy sesawings (especially in the truncated second version of his second sonata) between bathos and bombast. What was surprising was how well Scarlatti fit into this pattern. His rapid contrasts between, fast and slow, load and soft, major and minor also represent polar alternations—but somehow less neurotic ones. We like Scarlatti on piano and Yang clearly revels in the wit and liveliness of the Italian master. In the D Major Sonata L. 14 we heard distinctly varied takes on repeated figures. But what was consistent was the clarity of her technique; even though she colored and pedaled (this was not early music making), every note counted and nothing was blurred. She followed with lighting strikes through Scarlatti’s Sonata in A Minor L. 14, reveling in the in the condition of her award winning chops. Yang described the two Sebastian Currier pieces which followed as parodies of Scarlatti, while also letting us know that the wrong notes we would hear were the composer’s rather than the performer’s. Scarlatti Cadences, written for the force-of-nature pianist Emma Tahmizian (the composers former wife), opened with mysterious trills and free fantasias before gliding into scintillations— plausibly following a Scarlattian reciprocating structure. But Currier is more relentless than the earlier master and his wit heavier. Currier’s Brainstorms was something of a moto perpetuo—more a catalogue of piano technique than homage to Scarlatti. We heard lots of velocity and power, great trilling octaves, room-filling chords and crystalline runs. This was some of the fastest and loudest playing we have so far heard at Rockport in four years at Shalin Liu. When Yang came out to play Schumann’s Fantasy Pieces Opus 12, it sounded like a different instrument had been bought onto the stage. Limpidity replaced brass in her tender colorations. The sections were well differentiated and well characterized. In the Evening was inward and reflective, Soaring was impetuous, youthful and yet nostalgic, Why had the most generous rubato, Whims moved forward with an exciting inevitability, Fable seemed more nightmarish than in other renditions, yet the bad dream resolved into a gilded dawn as consoling as The Poet Speaks in Scenes of Childhood, and Dreams’ Confusions whirred by. Yang’s bravura dispatch of The End of the Song carried the audience away, but left your writer wanting a bit more freedom and patience from the entire set. Three songs by Rachmaninoff arranged and embellished by Earl Wild found Yang needful of discovering a bit more of the song and the sentiment amidst the filigree. There were certainly a lot of notes in Wild’s versions, transforming the originals almost as much as Godowski did in his elaborations of the Chopin Etudes. In Dreams Yang took a fast and somewhat relentless approach, almost sounding at times like Feux d’artifice. Wild’s own take on the piece was certainly dreamier [here]. The indestructible Vocalise came last. Yang’s piano sang more like a chanteuse than a weary Russian and Wild’s complicated additions seemed almost narcissistic. Have a listen to a very Russian and very weird Clara Rockmore playing the Vocalise on theremin here. The closer was Rachmaninoff’s Sonata No. 2 in B-flat major in the 1931 revision, in which the composer trimmed five minutes of “meanderings” according to Yang, leaving the work with stronger, more abrupt contrasts. Other performers have preferred Horowitz’s halfway-in-between version. Yang mowed down the sonata without any fear. She remains a fully armed competitor ready to take on any challenge presented. In this titanic performance, the iceberg would have surrendered. Yang responded to the grateful tumult from the audience with something Wild: his arrangement of Gershwin’s “My man done gone”- more notey than bluesy in this execution, I’m sorry to say. Scarlatti wrote many sonatas in D major and in A minor. What K. (Kirkpatrick) #s were they? There are enough Scarlatti-knowledgeable players and listeners out there that it’s important to be more specific so they understand what you are describing. Thanks. Unfortunately, Kirkpatrick made no appearance on the program, but Longo was there.